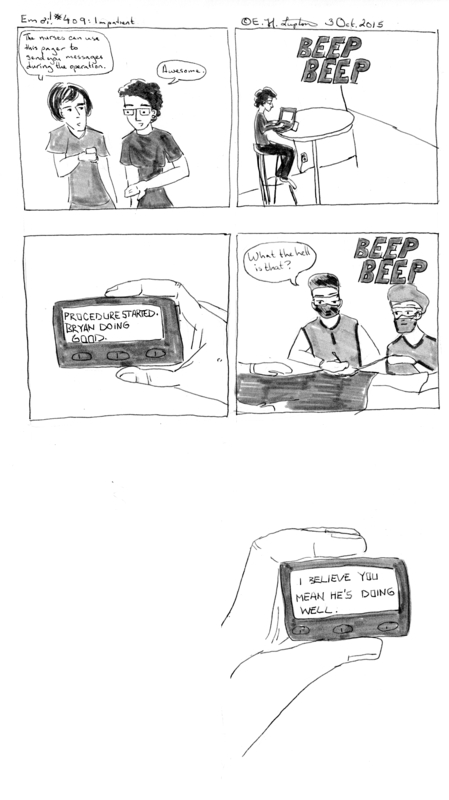 I actually cannot tell if I named this comic “Impatient” or “Inpatient.” Both seem appropriate. As you can see, I wrote this in early October, just a week or so after Bryan’s operation–this actually did sort of happen during the operation. But I got it uploaded only now because life kind of got away from me last month, a month during which I took care of Bryan, did one marathon and one half marathon, worked on my novel, and changed jobs, or rather job responsibilities, and went from working a kind of weird schedule that could vary from zero to eight hours or more per day depending on what work was available and needed doing to a more typical full-time work week. No other real news to report, other than since I last posted my novella came out in paperback and you should totally buy a copy. It i s currently held in the Yale library and in the Madison Public Library system and will shortly be available at several local bookstores such as A Room of One’s Own as soon as I can get my act together and drive them down there. Yiss. If you buy a copy and want it signed, or want a signed postcard, see the book tab above and follow the directions to send me an email. I have a race report for the last two half marathons (I did one this past weekend as well), which I will try to upload tomorrow or Wednesday. Let’s file this under P301 .L86 2015, for Philology. Linguistics–Language. Linguistic theory. Comparative grammar–Style. Composition. Rhetoric. Usage–General works.